Early June, Bath & Body Works had their Semi Annual Sale which meant tons of goodies almost for free! I am going to share with you all today what I managed to pick up during the sale. Prior to this mini shopping spree I had never done any shopping during their Semi Annual Sale, mainly because I was usually pretty stocked up on most of their products and also because I tend to avoid big crowds especially during sales. However this time I was really interested to see what they were going to have along with stocking up on more unnecessary items for Rudy and myself. I ended up picking up a few things from Bath & Body Works at two separate time. The first time was while I was hanging out with Imelda and then the second was the following weekend. 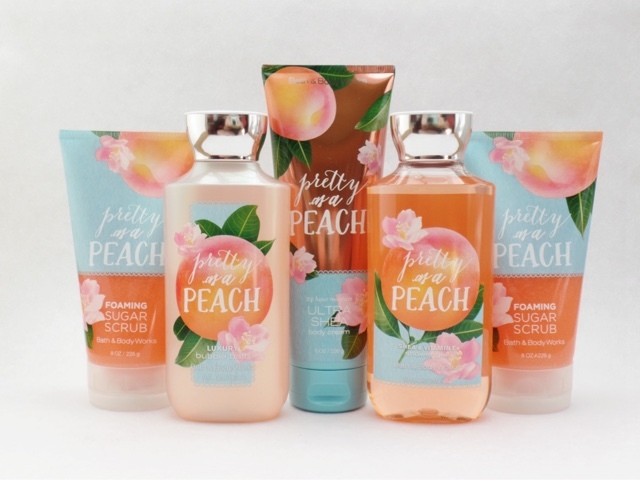 During my first mall trip I picked up nothing but peach items from their Pretty as a Peach line. I'm a big fan of that line and I already own a few of their products. One of the first items I grabbed was their foaming sugar scrubs. I already gave this guy a shout out on my June favorites so I going to keep it real short. After using this for the first time I knew that I was going to need to pick up some more scrubs and this sale was the perfect time. I ended up with two in my shopping bag which should last me a couple of months. Next I picked up the luxury bubble bath. I love bubble baths and I've never owned or tried any of the ones from Bath & Body Works. I had seen online that they carried one in the peach scent so I made sure to look for it when I was at the mall. I don't know how I never noticed this product before and I think Imelda even mentioned that they used to be in a different packing so we had probably seen them in one of our past hang outs but assumed it was their lotion and looked past it. I have yet to try this since it's been pretty hot and a bath does not sound like fun when its over 80 degrees out. I definitely wanted to grab myself another peach shower gel! I really enjoy the shower gels from B&BW especially the peach ones, the scent is so soothing to smell while I am in the shower. This is also the great time to stock up on shower gels and I made sure I did just that. After I shower I put on some body butter of some sort on myself to keep my skin soft and also to keep my tattoos looking their best. I think I've mentioned on my blog before that I don't really like lotions in general because I don't like that greasy. I own a couple that doesn't give that feeling on me but I am almost out. I've never liked the lotions from B&BW because they do exactly that so I always stayed away from them, but while I was shopping around I kept seeing this body cream. Once I read body cream I figured I should take it home with me to give it a try since this is different then their regular lotions and I've never even tried them out. This is the 24 hour moisture ultra Shea body cream and like all the other peach products it smells amazing. I have yet to use this body cream but I definitely will in a couple of weeks once I am all done with my current body butter. The following weekend I decided to make another trip to B&BW because Imelda had mentioned to me the night before that the prices on their sale items had been lowered. I decided I wanted to pick up some more scrubs and one of three was the Iced Pear Margarita sugarcane scrub. Imelda picked this one up the night before and it sounded really good so of course I wanted to give it a try. The mall was almost completely sold out on scrubs so I couldn't find anything good then one of the employee brought this to me since she knew I was looking for them. I then spotted one of the white sands body scrubs which is a bit different then their regular sugar scrubs it's a lot more fine and it's supposed to be better for people with more oily skin. The first one I picked up is Aloha Waterfall Orchid which by the way smells amazing!!! I was contemplating on buying the last two in this scent but I ended up only thing one. Then I picked up Tiki Mango Mai Tai which isn't in the photo since Rudy is already using it in the shower and he's loving it. I picked up two of the Watermelon Lemonade shower gel and one in Peach Bellini. I love Peach Bellini from B&BW and surprisingly I've never owned the shower gel. I'm very excited to use this because unlike the pretty as a peach shower gel this one is a lot more strong in scent. Lastly for my haul I picked up two candles because they were on sale for only $10. This was the second reason why I decided to make a second trip to B&BW. I really wanted to pick up some candles that I hadn't owned previously but I only ended up with one that is new to me. 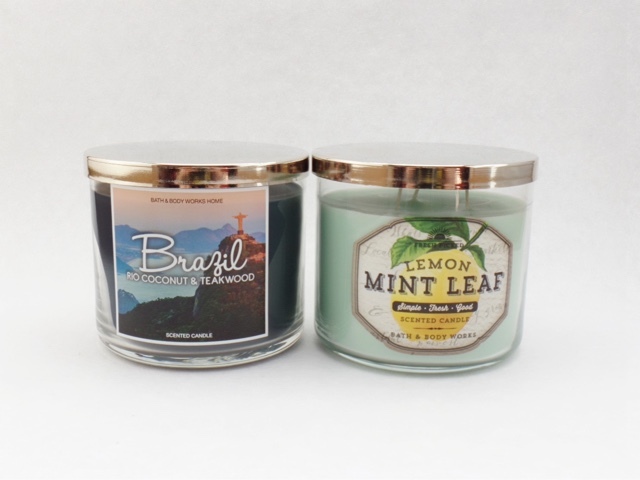 A few weeks ago I had seen this candle in Brazil Rio Coconut & Teakwood candle and it definitely caught my eye. I mainly wanted this candle because my mom is from Brazil making me half Brazilian and because it said teakwood. I love their mahogany teakwood candle and I was hoping it smelled similar, which is kind of does with a hint of coconut. On the bottom of the candle it says; Relax in the warmth of Rio's beautiful beaches with the marvelous mix of creamy coconut milk and inviting teakwood. The second candle I picked up is one I mentioned on my blog in the past but it's been re-released with a new packaging and new name and it is the Lemon Mint Leaf. Since I've already talked about this in the past I'm not going to spend time on it again also because I'm making a new post with this candle included and I get more into detail on it so keep an eye out for that. Now this does it for my Bath & Body Works Semi Annual Sale haul and I hope you've enjoyed seeing what I spend my money on haha. I feel like I picked up a good amount of products for rudy and myself which I am very satisfied about. Did any of you pick anything up during their sale? What was your favorite products? you got so much stuff. i love their shower gels. Mmmm, I'm trying to remember if I knew you were Brazilian too. I don't think so but thats awesome! I loved all the goodies we always get. Haha yup, my mom is Brazilian and my dad is Portuguese. I swear I look for reasons to shop at B&BW. I love their body scrubs!!! I worked there for two years and I literally had NO SELF CONTROL lol I would buy everything. Even know I have tons of product that will probably last till the end of time but I constantly need more! lol You got some great deals girl! I feel like I have no self control when I go in there sometimes haha! I wanted to make sure I got some goodies during this sale since I've never gone to them. I need to try that peach sugar scrub it looks and sounds heavenly.